The appended transcript deserves careful examination. It records in writing what Vancouver Police Department representative Brian Montague said about PiDGiN protest at a press conference on 17 April 2013 . The video stream currently available on the Vancouver Police Department web site only permits a straight play-through that lasts approximately twenty minutes. There is no slider button to permit backtracking and instant replay. Few watchers of the video are likely to have the patience or concentration to wait for a full circular twenty minutes to get one more listen to exactly what was said. This transcript seeks to avoid editorial smoothing, and attempts to capture verbal nuances of hesitation, uncertainty, and groping. Persons unwilling to plow through the entire transcript may have interest in skipping to the appendix to view highlighted themes extracted from the VPD discourse, accompanied by questions that these themes raise. All text is Constable Brian Montague speaking, unless marked as "Media"
The Vancouver police are, uh, taking the unusual step of warning a small number of protesters related to the recent PiDGiN protests in, uh, in the Downtown Eastside. As you may be aware, these -- these protests have been going on for about eight or nine weeks now, and I sort of wanted to give you an idea as to, uh, how the police are -- are dealing with some of the issues that have arisen. Um. We believe that, uh, there are uh, a few individuals that are crossing the line between peaceful protest and criminal acts. So starting today, a written notice will be given to a small number of individuals. This notice explains that the Vancouver police are committed to providing an environment that allows for safe and lawful protest, as well as ensuring that others are not denied the lawful use and enjoyment of property. It explains the legal definition of criminal mischief, and that police will take action in related -- in relation to anyone participating in an -- in an activity that is alleged to go beyond peaceful and legal protest. Everyone got a shot of them? [camera clicks] We'll put this on our web site. I'll also give you, uh, a copy of it when we're done today. I have about twenty copies that I can give you. We want to make our intentions very clear, and caution those that -- who may be interested in, in engaging in illegal behavior during these protests, and let you know that we do expect to make an arrest soon. The VPD facilitates hundreds of protests each and every year, ensuring the safety of both protesters and the general public. Most of the protesters we encounter are committed to lawful protest, and this letter is just another tool we're using, to fac-facilitate peaceful demonstrations and is intended to notify this small group that their actions could lead to criminal charges. I'll take any questions you have. Media: How many protesters are receiving this letter? Media: Is it less than ten? Uh, right now it's less than ten, and that number may change depending on the actions of those protesters, obviously, um. But I do want to make it clear that the Vancouver police supports the fundamental freedom of peaceful assembly, um, but when public safety is at risk, and civil disobedience turns to unlawful acts, uh, the police have uh, a duty to act on those. Media: You said that there might be an arrest soon? Is this in regards to what? We are anticipating an arrest, uh, soon, and it's related to the PiDGiN protest. I-I can't go into specifics, other than to say we're anticipating an arrest. When an arrest is made, we'll -- we'll supply all the details, uh, but I can't say who, or what the circumstances are regarding that. Media: And this is for something that's -- that's already occurred? Media: What were they doing that crossed the line? Uh, again, I can't go into specifics, but, uh, their actions, uh, have gone beyond what would be considered a lawful protest, and have become criminal. Media: So, Brian, what may cause an arrest then? Uh, I -- I don't know if I understand your question. I think I -- I think I see what you're getting at. Media: What they going to do if -- if -- if -- that they would cause an arrest? I wouldn't be able to give you every scenario, obviously, um, but … the definition of -- of say, say, mischief, is -- is basically not allowing an individual, um, the uh, um, uh -- ah -- this is not allowing the individual for the peaceful, the lawful enjoyment of property. So, in the case of PiDGiN, the protesters have targeted a specific business, um. They have, uh, made it quite clear that, uh, they're targeting this business, and, as a result, they're not allowing the -- the owners, the staff, and the patrons to lawfully use this property, uh, and that's where i-it can cross the line into -- into criminal charges. Media: Was this prompted by a complaint? Media: The, the, investigation, it sounds like -- or was it the restaurant, or was it the neighborhood -- who complained to prompt this action? The -- the action of the letter itself? Or just the general monitoring of the process? So, I'll try and answer your question for you, John. Uh, uh, we monitor all the protests that go on in the City of Vancouver to make sure that, uh, those participating in the protest, and -- and the citizens of Vancouver, are -- are, uh -- are safe, and the actions of protesters are -- are peaceful and lawful. Uh, so we've been monitoring this protest like we would every others -- every other protest, um, uh. Certain actions by individuals, um, uh, have, uh, uh … have given us a concern that, um … they're, uh, they're crossing the line, basically. We don't -- we want to maintain an open dialogue with protesters in every case, and this case is no different. The letter is -- is simply, uh, another method of dialogue between us and -- and a few individuals that, uh -- that are going beyond peaceful protest. As far as the arrest is concerned, of -- of an individual that -- that we're anticipating, um, I can't go into any details as to -- as to exactly what, uh -- what that's about, uh. Media: You're saying that the VPD is essentially watching the news, was concerned of its own accord, and then is now sending letters and threatening arrests, without the involvement of any complaint? Uh, i-it's a -- we're not legally obliged t-to -- to supply this letter. And we're not providing the letters to all the protesters down there. Uh, from our own observations, we have seen certain protesters that are going beyond, uh, lawful protest, and it's just another tool to inform them that their actions may result in criminal charges. Media: Is the fact that their protesting itself -- you've said that it's causing people -- it's causing difficulty for the owner to conduct his business. Is the protest itself causing problem -- and is that the issue, or is it more than just protesting? There are -- are many issues, obviously, an-and we facilitate hundreds of protests every year with-without any problems, uh, but when, uh, individuals prevent someone from the lawful use and enjoyment of, of uh, of uh, of their business, then it possibly becomes criminal. Um, we will investigate that. Media: So the length of time that they've been protesting, is that an issue? It would -- it might form, um, one of many aspects with regards to what's going on, um, but the length of a protest isn't necessarily the only factor, um, there have been many other protests, uh, in Vancouver that have gone on for weeks, months, years -- Um, uh, uh, so that's not the only factor. It would -- it would play a part, uh, of the investigation, but it's -- it's definitely not the only -- the only part. Media: How many calls to police have you gotten about this protest? Media: How -- how is that factored into the decision? Again, ev-every little piece that -- that, uh, regarding these protests would, would be looked at as part of the investigation. Um, so, the, we'd look at police observations, um, complaints, uh, uh, the length of-of the protest, um, we'd look at a number of things before making a decision to file, uh, or to provide a report to crown counsel, um, so it's -- it's hard to answer that question. It's a concern, um, that -- that by providing this letter to -- to some individuals that it might escalate things. We've been in contact with uh, um, with, uh, the business community down in the area, um, within uh, you know, we've had an open dialogue with the protesters for, for uh, for eight or nine weeks, um, um, and that's something that, uh, that could be a concern, but we think it's important to let these protesters know that, uh, while we support peaceful, and lawful protest, uh, we will act if -- if the line is crossed and criminal actions -- a-and criminal acts take place. Uh, we hope that we don't have to act. We -- we hope that the letter will, uh, will inform these people that, uh, uh, uh, uh, what the law says, uh, and that uh, um, and -- and outline what the difference between peaceful protest an-and an illegal act is. Media: So it's an issue of safety for these people -- patrons [unclear] to do their business? Again, that's part of it, right -- the -- the legal definition of -- of, uh, say mischief -- the, um, something that is explained in the letter here, is that the individuals aren't allowed to lawfully use and enjoy their property. Media: Is it just PiDGiN, or, uh, or is it other businesses in the area? Uh, for the most part, uh, it's PiDGiN. That is the target of these protesters right now. Uh, uh, and uh, the restaurant itself is -- is, uh, uh, been a target for eight or nine weeks now, and they're unable, or have, uh, uh, had their patrons and staff are now unable to -- to lawfully use their property. Media: [unclear] just to clarify, uh, an arrest is coming, that -- that's a fact? We anticipate an arrest, yes. Media: It's a matter of finding -- is it just one person that we're talking about? Media: And it's just a matter of finding that person? We're looking -- we're actively looking -- we're actively looking for this person, yes. Media: [unclear] details of the complaints? I don't have details of complaints and I don't know how many complaints we've received. O-o-obviously, the police have been monitoring the protest, like we do every protest that happens in Vancouver, um, and based -- a lot of it based on our own observations, as well as complaints that we've received. Uh, it was decided that, uh, a letter, to inform key individuals involved in the protest, uh, would be a way to continue, uh, dialogue with them, and to make sure that they understand, uh, that their actions could be deemed criminal. Media: Is the individual male or female? Media: You'll probably let us know when the arrest is made? Yes, that is our plan, as soon as the arrest is made, we will, uh -- we will inform you of that arrest, um, uh, and uh, provide you as many details as we can. Media: Uh, this individual crossed the line, the rest of the protesters haven't, which is why you're giving them the letter to clarify what they can and can't do in terms of a protest. I think that's -- I think that's, uh, safe to say, yes. OK. If there's nothing else, I'll go on to the next. Media: [unclear] Have you ever sent a letter like this before to, uh, protesters or to anyone about to commit criminal activity -- have you ever sent a letter saying "Please don't"? I can't think of a specific instance, no. So it is, uh, unusual for us to do something like this, but uh, uh, we're viewing it as a -- as a tool, uh, to inform them that, uh, that they're -- that while we support peaceful and lawful protest [two echoes] -- We'll wait for that to stop [unclear]. While we support peaceful and lawful protest, we will act if, uh, if, if, civil disobedience turns unlawful. We want to explain to them, and make sure they understand, um, what that behavior is. And when I give you a copy of the letter, that might answer a few questions for you. Media: Why a letter and not just verbal? Uh, I think part of it is so that, um, we can show them down the road, if the behavior doesn't change and does become criminal, that, uh, they've been warned. They've been told that, uh, that certain actions, uh, could, and -- and might result in -- in criminal charges. Media: Will you be keeping track of the people who you give the letter? Yes, we will be. There actually will be a-addressed specifically to certain people. There actually, uh, uh, will be, uh, labelled and addressed to -- to -- to a person's name. Media: Will you give us a list of those people? I will not. Sorry. … OK? Media: Do you have copies of the letter? Yes, I have copies of the letter here -- I'll leave them up on the podium, and uh. Media: What about the letter? I mean I can see Wendy Pedersen or someone like that saying that this is a clear example of a private individual using the police as, you know, their, their strongman, to stop the expression of free speech. And, do -- do you think you're handing them that opportunity with this letter? No, and again, the letter is not going to every protester. Uh, we're not … you know, uh, blanket -- blanketing all, uh, the protesters with this letter. We fully support, and facilitate, peaceful and lawful protest, and I want to make that very clear. We're not here to, uh, um … to stop these people from protesting. We're here, uh, and the letter is intended, uh, for a very small group of people who are, uh, going beyond lawful protest. It's a bit of a convoluted and a what-if question, so it's tough for me to answer, um. But I think the best way to say this is, is there a hundreds of protests in Vancouver every year. We make very few arrests. We don't have to intervene in most of the protests that, uh, -- that occur in this city. Um, however there are, uh, a few people, uh, that under the guise of peaceful and lawful protest, uh, resort to criminal acts … and the police have a duty to act when -- when that happens. The letter is -- is a tool for us, um, to show these people that, that we're paying attention to what they're doing, and that, uh, you know, if they continue to behave in a, in a way that goes beyond lawful protest and becomes criminal, they're subject to criminal charges. Anything, I mean, uh, there's a number of things, but, uh, but the letter specifically talks about, uh, mischief, um, which, so -- which would include any behavior that -- that prevents the lawful use and enjoyment of property. That, that could be part of it, and sometimes it's not just, just one -- one single event, it's -- it's the totality of events that, that would lead to a criminal charge. So, i-it's very hard to explain, and the letter hopefully, uh … you know, gives these people a guideline and explains it to them. I don't know. Thanks everybody. Don't forget your recorders. "Sometimes it's not just, just one -- one single event, it's -- it's the totality of events that, that would lead to a criminal charge. So, i-it's very hard to explain, and the letter hopefully, uh … you know, gives these people a guideline and explains it to them"
How can the letter explain something that is "very hard to explain" in person to media? How can a criminal charge be based on a "totality of events" rather than a specific event? 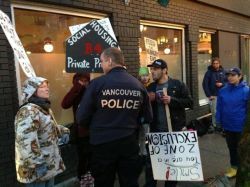 "The Vancouver police are, uh, taking the unusual step of warning a small number of protesters related to the recent PiDGiN protests in, uh, in the Downtown Eastside" … "So it is, uh, unusual for us to do something like this"
Does this "unusual step" amount to anything more than a crude act of intimidation? Is it ever appropriate to provide anticipatory written warning against potential criminal acts? "And let you know that we do expect to make an arrest soon" … "We are anticipating an arrest, uh, soon, and it's related to the PiDGiN protest" … "I-I can't go into specifics, other than to say we're anticipating an arrest. When an arrest is made, we'll -- we'll supply all the details, uh, but I can't say who, or what the circumstances are regarding that" … "As far as the arrest is concerned, of -- of an individual that -- that we're anticipating, um, I can't go into any details as to -- as to exactly what, uh -- what that's about, uh" … "We anticipate an arrest, yes" … "I'm not going to go into any details about that, so, uh, no, not until, uh, the arrest is -- is made -- I haven't been authorized by the -- the investigators to provide any details, so …" … As soon as the arrest is made, we will, uh -- we will inform you of that arrest, um, uh, and uh, provide you as many details as we can" … "We make very few arrests. We don't have to intervene in most of the protests that, uh, -- that occur in this city"
If it is unusual to issue a preemptive letter, how much more unusual is it to parade a mystery offender in advance of an arrest and to refuse to even name the offense? At what stage does feeding media on a vague threat of arrest cross the line into propagation of state terrorism? Will this assertion of connection to the PiDGiN protest prove to be as insubstantial and careless as recent media conflations of concurrent events? "Civil disobedience turns to unlawful acts" … "Civil disobedience turns unlawful"
Does the Vancouver Police Department believe that civil disobedience is in essence lawful? "There are uh, a few individuals that are crossing the line between peaceful protest and criminal acts" … "So, in the case of PiDGiN, the protesters have targeted a specific business, um. They have, uh, made it quite clear that, uh, they're targeting this business, and, as a result, they're not allowing the -- the owners, the staff, and the patrons to lawfully use this property, uh, and that's where i-it can cross the line into -- into criminal charges" … "Certain actions by individuals, um, uh, have, uh, uh … have given us a concern that, um … they're, uh, they're crossing the line, basically" … "while we support peaceful, and lawful protest, uh, we will act if -- if the line is crossed and criminal actions -- a-and criminal acts take place"
Why has there been so little police concern about the lines crossed by those who attack protesters with bear spray, those who make verbal threats against the property and persons of protesters, those who feel free to confiscate protester property on unenforced pretext, and those who make hostile bodily contact with protesters? "This letter is just another tool" … "And it's just another tool to inform them" … "We're viewing it as a -- as a tool, uh, to inform them" … "The letter is -- is a tool for us, um, to show these people that, that we're paying attention to what they're doing"
What precedents justify targeting and intimidating a few specific individuals with the letter tool? "We want to maintain an open dialogue with protesters in every case, and this case is no different. The letter is -- is simply, uh, another method of dialogue between us and -- and a few individuals" … "We've had an open dialogue with the protesters for, for uh, for eight or nine weeks" … "A letter, to inform key individuals involved in the protest, uh, would be a way to continue, uh, dialogue with them"
Have the police had far more "dialogue" with complainants, politicians, and business interests? Can a highly selective, unidirectional written communication, first unveiled at a press conference, be considered an example of dialogue? "It's a concern, um, that -- that by providing this letter to -- to some individuals that it might escalate things." Does the assembly of forty to fifty people in front of PiDGiN on the evening of 17 April 2013 confirm that the Vancouver Police Department chose to escalate the situation? "A few people, uh, that under the guise of peaceful and lawful protest, uh, resort to criminal acts"
Do police use the guise of law enforcement to further the interests of the rich and powerful? What purpose does this kind of innuendo serve?